This is my Pinterest Profile. 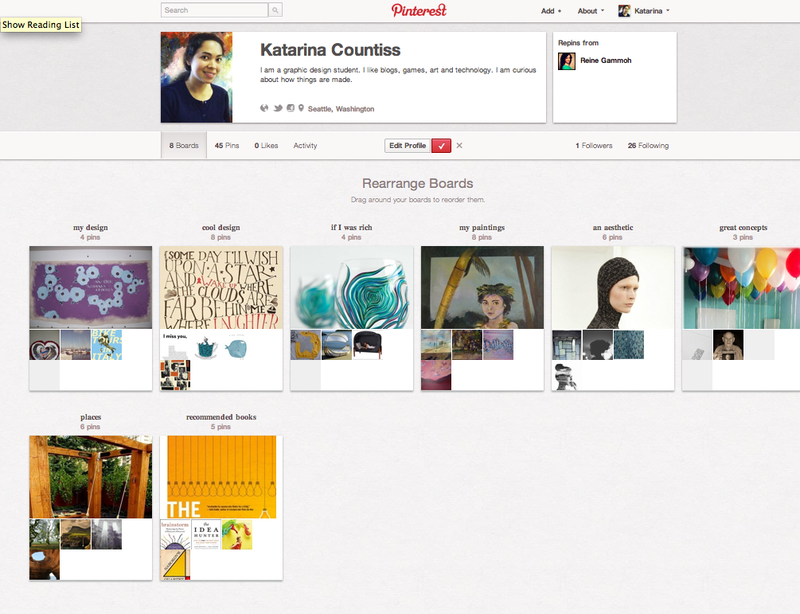 I was curious about Pinterest because a lot of my graphic design peers were talking about it. This is my very first internet thing review. Today, I investigated it and can definitely see the appeal. I was lost in Pinterest for an hour or so, gathering up some images. It’s a very visual social media app. I recommend it to people who love eye candy. People that want to make a scrapbook of all the visual lovelies on the internet, from fave celebrities to clothing I wish I owned and art that I like. It’s an interesting app because it goes two ways. You can discover an overarching theme to the things you like, color, mood, etc. as well as exploring your friend’s aesthetics as well. It’s a visual way to see personal taste. On vacation with some friends, we went to get our auras photographed. (I’ve lost the pictures, but I imagine they are somewhere in my mother’s house.) Yes, there’ s apparently some kind of aura photographing device and it seemed to be relatively accurate, which is surprising. The point is that afterward, I felt very enlightened about myself and my friends that I wish everyone could have an aural photograph to know themselves and to have others know them better in a very visual way. Pinterest is like that. I recommend it, certainly as a way to past time like those personality tests of the oughts(the 2000s) were.